The parks known as Ontario Beach Park and Deep Run Park became county parks by accident. Both had been used by the public for decades prior to becoming county property in 1969. The state claimed that both parks consisted of parts of the right-of-way of state route 364 (East Lake Rd.). In addition, the Town of Gorham also claimed a right of way that predated the movement of route 364. An adjacent landowner also claimed a portion of the park. That person even tried to block public use of the informal park by erecting a short-lived chain link fence across the north end of the area. 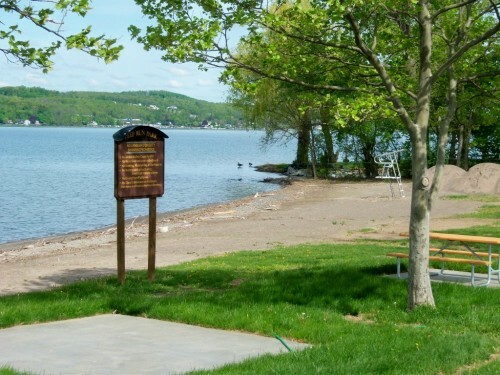 The Daily Messenger published a story on February 27, 1967 reporting that “The Ontario County Board of Supervisors has tentative plans to develop a lakefront property known as Deep Run into a county park at some time in the future. However, there have been several complications regarding title to the land…” It took several years to clear the title to both parks with the state insisting that they be cleared together. In practical terms, both stretches of park were created when the East Lake Road was moved a few feet to the east, taking it away from the lake shore. In the underbrush at the north end of Deep Run Park you can still see the old highway bridge (picture to the right) that once carried traffic over the stream that gives the park its name. Deep Run was a popular picnic area early in the Twentieth Century and a popular dance hall was built there. In 1937, Canandaigua Supervisor, Alfred H. Dewey, proposed that Ontario County purchase land for a county park at Deep Run. While the Supervisors appropriated $1000 for the lakeshore property, the actual sale was never completed. For many years, into the early 1960s, people who wanted to wash their cars would simply drive them across the shale beach into the lake up the hub caps and clean their vehicles! Work on a real county park finally began in October, 1970. Over the years, a lawn area has been planted on the formerly barren beach and life guards have been hired each season. A bathhouse with sanitary facilities was added in 1979. A favorite beach for families with small children, there is an 80 foot drop-off about 150 yards out.